It is important for students to recognize figurative language in literature in order for them to clearly understand the author’s purpose. 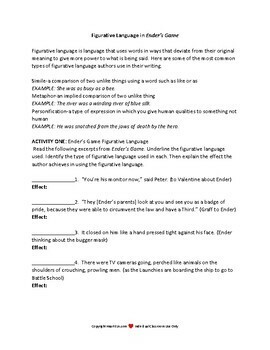 In this packet you will find definitions of three types of figurative language: simile, metaphor, personification. Students have two activities to complete. 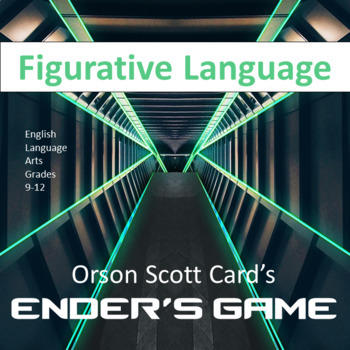 There are several quotes from Ender’s Game for students to use in learning to identify figurative language and to think about the effect the figurative language has on the text. An answer key is provided for this activity. 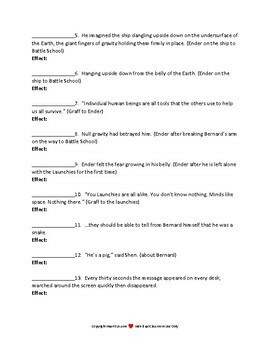 This is a group activity in which students are given characters and items from Ender’s Game and are tasked with creating either a simile, metaphor, or personification for that character or item to achieve a particular effect. 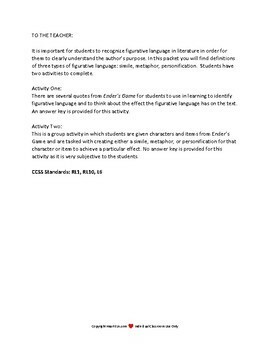 No answer key is provided for this activity as it is very subjective to the students.